Passport Photos Delivered to anywhere in the UK - Guaranteed Pass. With Reload Internet we understand the pain and frustration of visiting Photo Studios to get your Passport Photos for the renewal of your Passport or renewal of your Driving licence and we are now able to have your Passport Photo Delivered to your home. 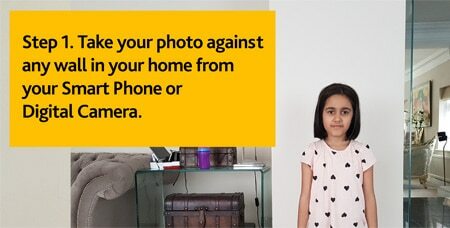 All we require is a photo of yourself taken from the comfort of your own home. We will look over it free of charge and once confirmed the image is suitable, we will have it delivered to you within 2 working days. We also can post it next working day when your application is required in a rush. At Reload internet, we operate a guaranteed pass policy for any Passport Photo we print and deliver to you. That is how confident we are in what we do and no one else currently offers this guarantee. Once you we confirm your photo is suitable – we will remove all of the shadows from the background (and other imperfections) and we will rescale it to meet the Embassies requirements (even meeting stringent UK Biometric standards). All photos are checked by our Senior Manager in house, for compliance and then posted to you. Reload Internet offers a one-stop service and we are able to guarantee our work before delivering your Passport Photos to you. Best of all, taking the photo to email us, could not be simpler. We will zoom crop and edit your image graphically, removing all shadows. Our Passport Photo service is a premium service and our service will save you a wasted day at the Embassy and the time it takes to visit a professional photo studio to take the photos in the first place. We are very transparent in our prices and the prices include recorded delivery to anywhere in the UK within 2 working days of us approving your photos and payment received. If you are unsure about the size you require, please visit this page, which will show you the Passport Photo sizes for every Country in the World. Ready to send us your Images? Need further help on any of Reload Internet Services? We offer our in-store customers a range of services. Passport Photos, Visa Photos, Indian passport Photo, Digital Passport Photo. We also offer Business Services including: Printing, Scanning, copying, Binding, Laminating and Mobile Data sim cards for your mobile. Located opposite Paddington Station and the Hilton Paddington. Next to VFS Global, Indian Visa, OCI, Passport and Consular services centre.